Danner is known for their high quality boots that are built for great outdoor performance. The Danner High Ground and Pronghorn models are two of their most popular hunting boot styles. Both offer great stability, waterproof protection and insulation options. But which one is better? Let’s delve in and discuss some of the differences. When it comes materials neither the Pronghorn or the High Ground skip out on quality. The uppers on the High Ground boot is a mix of buttery soft nubuck and 900 denier polyester. The nubuck is soft enough to provide an easy break in period while being tough enough to handle outdoor conditions and provide good waterproofing. The 900D polyester is abrasion resistant while giving the boots it’s cool camo look. Danner Pronghorn’s feature full-grain leather instead of nubuck paired with 1000 denier nylon. The leather has been especially treated by a “CamoHide” process that gives the leather a faint camo marbling look. The nylon on the uppers can be picked to match the leather or have a camo look much like the High Ground depending on which color options you choose to purchase. Danner High Ground vs Pronghorn construction comparison. Unlike other Danner boot models, neither the High Ground or Pronghorn are recraftable. That means if the soles are worn or if something comes undone with use they won’t be repairable. Although most hunting boots are not repairable, it still would have been nice to have this feature available. Understandably, this is due to their construction. Neither of these boots feature a stitch-down construction and are partially glued to the uppers. As far as stitching goes you can expect to find beautiful stitching on both boot designs. The High Ground features durable double stitching across it’s uppers with reinforced leather on the toe box and heel. The Pronghorn also has double stitching through it’s uppers but features a rugged triple-stitched leather reinforcement on the toe and heels. Danner High Ground vs Pronghorn toe box comparison. Because of the materials and construction used, it’s safe to say that the Danner High Ground was constructed as more of a lightweight boot that supports ease of movement and flexibility. The Pronghorn however was constructed with ruggedness in mind and is meant to withstand more punishment thanks to it’s tough full-grain leather and 1000D nylon. Let’s start with outsoles. The Danner High Ground boot features a proprietary Danner Talon outsole. These lightweight soles are made for outdoor conditions with a emphasis on ground grip. At a closer look you’ll notice a combination of black and orange lugs that allow the soles to “stick” to the ground to avoid slipping and add stability in wet and muddy conditions. The outsoles on the Danner Pronghorn focus a bit more on ruggedness and multi-terrain use. These low profile outsoles are made to be able to tackle a variety of terrains and are a more versatile option to the Danner Talon outsoles on the High Ground. While the Danner Pronghorn outsoles do provide great stability, they do not have the same “sticky” properties that allow the Danner High Ground to firmly grip the ground with each step. As for comfort and fit both boots are made with athletic lasts. This provides a fit unlike many athletic sneakers where there is more room in the toe box and a good amount of support on the heel. Specifically, the Danner High Ground uses a DT4 last while the Pronghorn has a DPH-1 last. Although they have slightly different fits, overall they are very similar. Because the Danner High Ground is specifically made for hunting, it has fit similar to a hiking boot. Inside the boot you’ll find the usual Danner features on both the Danner High Ground and Pronghorn. Both boots are extremely lightweight. This is thanks to Danner’s Terra Force platform that adds stability while still keeping the boot light. Both also feature lightweight nylon shanks. Where these boots differ is their footbeds. While the High Ground features a removable antimicrobial polyurethane footbed the Pronghorn has a triple-density PU Ortholite footbed. Again, just like their outsoles the High Ground footbed focuses more on outdoor hiking needs such while the Pronghorn focuses more on overall comfort for versatile conditions. Danner takes two different approuches to lacing. Although both of these hunting boots have many similarities they both take completely different approaches to lacing. The Danner High Ground uses a special “Lock & Load” lacing system that replaces traditional eyelets with nylon ghillies across the forefoot. On the top of the boot you will find four speed hook laces for easy on and off. The ghillies are actually a great idea in terms of comfort as the lack of metal eyelets will relieve pressure in the instep, especially when first breaking in. The Danner Pronghorn uses traditional metal eyelets along the instep and then four speed lacing hooks on top. One unique feature to note however is that the third speed lace from the top actually extends to the middle of the ankle. This small feature is actually a really smart way of making the boot more secure when worn. 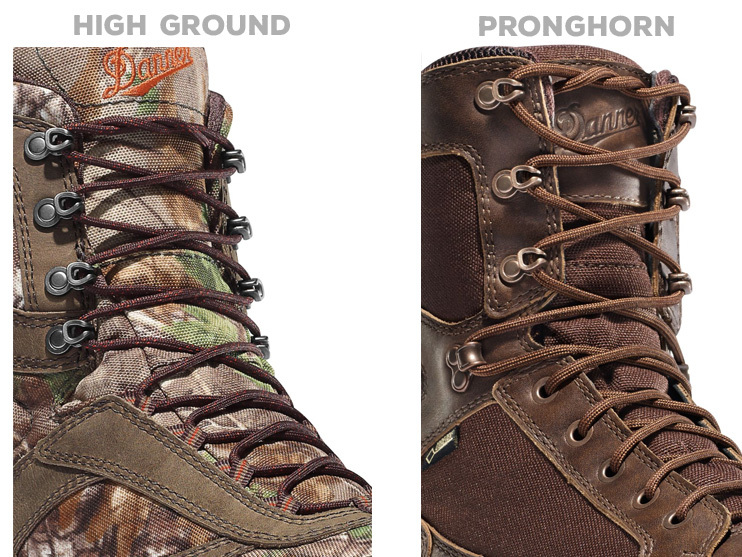 There is no difference when it comes to lining between the Danner Pronghorn and High Ground. Both are fitted with a waterproof Gore-Tex lining that keeps feet dry. Where these boots differ is their insulation options. Although both boots are available uninsulate, the Pronghorn offers 400G, 800G, 1000G and 1200G insulation options. While the High Ground only offers 400G and 1000G insulation. 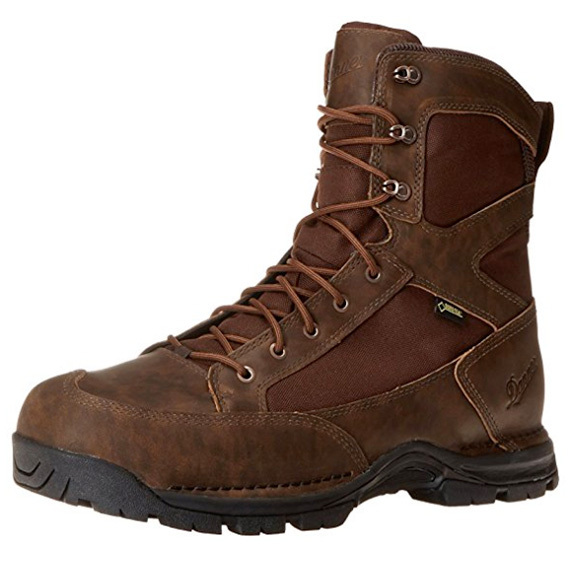 If you are looking for extra insulation past 1000G’s or simply want a happy medium between the insulation that the High Ground offers then you will definitely have more customization options with the Danner Pronghorns. As hunting boots, both of these boots share more similarities than differences. Both are waterproof, provide great stability in outdoor conditions and have great construction. The main difference between the Danner High Ground and the Pronghorn is that one is more of an agility-based boot while the other is made for overall ruggedness. Which is better? Well that really depends on what you value. If having a lightweight boot that provides great movement and ground grip is what you need, then the Danner High Ground may be the boot for you. On the other end, if you would rather have a rugged all-terrain boot (with better insulation options) then the Pronghorn may be the better option.